The Dictionary of Unfortunate Ideas: Two giants of the cinema talk to a small fry. That's Sasquatch to you Bub! Two giants of the cinema talk to a small fry. 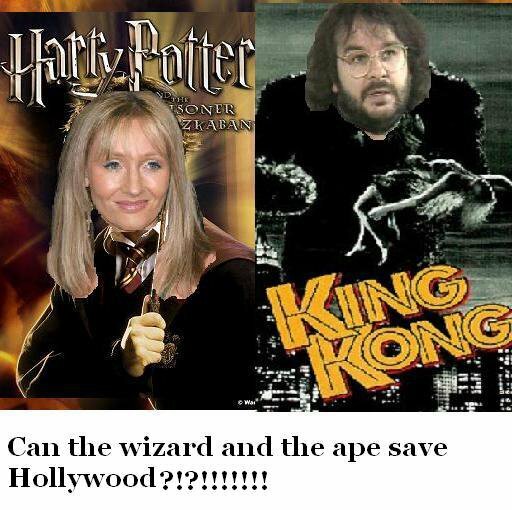 An article I read the other day asked, "Can the wizard and the ape save Hollywood? ", another way of asking if a slumping film industry can rebound from its recent malaise with the upcoming release of the next Harry Potter installment and Peter Jackson's King Kong. I decided to sit down with the two driving forces behind the films, King Kong and Harry Potter... I mean Peter Jackson and J. K. Rowling. Stew: Peter, J. K., thank you for spending a little time with us. J.K.: Did you get the rider for my appearance? J.K.: That's a little more like it, now where are my apples and albacore tuna? Stew: They're being brought in now. Peter let me start with you while Ms. Rowling is making a plate. Why King Kong, why not Godzilla vs. Megalon or Attack of the Killer Tomatoes? Peter: (eating a banana) Well Stew, King Kong is one of the originals of the genre. When I start out to make a movie I only have one question, "What will make me the most money?". I figured if Dino de Laurentiis could make cash on it, hey, anybody can. Stew: True. Is that all it's about to you though, money? Isn't there something that makes you want to tell the story of an oversized ape from a mythical pre-historic island who battles dinosaurs and falls in love with a beautiful girl before being taken back to New York City as an exhibit, ultimately falling to his death from the top of the Empire State Building? Peter: (taking a drink from his 32 oz. collectible KONG mug) Well, I do want to delve deeper into the personality of the big ape. I want to know his loves, his hates, his favorite color, and what he does on a rainy afternoon. Stew: Does that explain your hiring of Barbara Walters to play Ann Darrow? Stew: And one has to question casting Jack Black as the monstrous ape after his comic turns in such classics as "The School of Rock" and "Saving Silverman". J.K. how is the tuna? J.K.: I need my omega 3 fatty acids or I get a little gassy. Stew: I understand, tell us about Harry Potter and The Globule of Fire. J.K.: That's, Goblet of Fire. Stew: Oh, what did I say? J.K.: You said, Globule of Fire. Stew: Terribly sorry, tell us about the Omelet of Fire. J.K.: (fuming) What would you like to know, how many eggs we used? Stew: Yes, tell me how many eggs you used. J.K.: That was a joke!!! Stew: Peter, why the use of claymation? It seems to make it too "Wallace and Gromitish" don't you think. Stew: Now where were we J.K.? Oh yes, your Rupert Grint fetish. Please continue. J.K.: (finishing a cigarette) We're finished. Good......Bye! Stew: Was it something I said? J.K.: (pointing a plastic wand at Stew) Avada Kedavra!!!!! Stew: Well, I guess that's all we'll learn about the Hobbit of Fire. J.K.: (in the distance) Goblet, you idiot. Stew: Peter, is there anything you'd like to say as we close? Peter: (wearing "I Fell for Kong" t-shirt) Can I have the rest of her tuna?